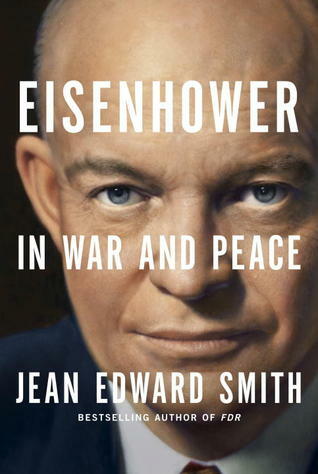 Published in 2012, “Eisenhower in War and Peace” is Jean Edward Smith’s third presidential biography (following “Grant” in 2001 and “FDR” in 2007). Smith taught political science at the University of Toronto for 35 years and at Marshall University for 12 years. His most recent (and controversial) biography “Bush” was published in July 2016. The first comprehensive biography of Eisenhower in more than a decade, Smith’s review of the 34th president is lengthy (with 766 pages) and occasionally exhausting. But rarely is it dull, and the author’s enthusiasm for his subject infuses nearly every page of this well-documented book. Smith rates Eisenhower as one of the two most successful of twentieth-century presidents (behind only FDR) and covers his personal foibles and battlefield failures with candor and clarity. But he is unfailingly complimentary toward Eisenhower’s two-term presidency. And in the end, the character who emerges from this book is ambitious, flawed, an excellent politician and a capable (if not quite great) president…but stubbornly enigmatic. Smith devotes half the book to Eisenhower’s military career versus about one-quarter to his presidency. Many readers will puzzle at this imbalance but Ike’s pre-presidency is where the book shines brightest. The author vividly and thoroughly describes his steady march from West Point cadet to Supreme Allied Commander in Europe. And no reader will miss how Eisenhower’s military career well-prepared him for the presidency. Eisenhower’s military career was punctuated by frequent moves, invaluable mentors and relentless behind-the-scenes maneuvering. But while this period of his life provides a seemingly endless array of captivating stories, these fifteen chapters sometimes feel long and overly detailed. In contrast to discussion of his military career, the eight-year Eisenhower presidency is organized topically and not chronologically. As a consequence, readers unfamiliar with American history during the 1950s will learn a great deal about the decade’s most important moments but may be unsure of (or flatly confused by) their sequencing. This portion of the biography often seems strangely organized, with occasional non sequiturs. In one instance, no sooner has Smith introduced the reader to legendary House Speaker Sam Rayburn than he launches – with no transition whatsoever – into a discussion of Eisenhower’s interstate highway initiative. But this book’s high points far outweigh its shortcomings and any committed reader will find much to enjoy and absorb. Smith is excellent when incorporating new characters into the dialogue and in the case of General Marshall even provides an astute comparison of Eisenhower’s attributes with those of his fascinating one-time mentor. And continuing a style exhibited in his earlier biography of FDR, Smith liberally incorporates insightful and often detailed footnotes into the text. Some readers will be tempted to skip over these but they consistently add important flavor and context to the narrative. Overall, Jean Edward Smith’s biography of Dwight Eisenhower is a revealing, detailed and colorful look at a man described by many (including his wife) as mysterious and somewhat unknowable. And while Smith’s intention in writing this biography seems to have been burnishing Eisenhower’s presidential legacy, the man described here is less great and more wonderfully complex, interesting and human than may have been intended. I’m chipping away at this on my kindle. It’s enjoyable so far. I’m leaning towards picking up a paper copy to make endnote reference easier. As much as I would love to embrace the convenience of e-books, I buy and read paper copies of books just to make the *reading* easier! 🙂 By the way, although I definitely liked this book, it is my third favorite of the three I’ve read by him (I liked his Grant and FDR bios slightly more, and those were the best on those presidents which I read, period). Thanks for the great review, Steve. I’m looking forward to reading this book, which is sitting on my shelf. This will be my first taste of Jean Edward Smith’s biographical expertise and I’m curious what to expect. Seems like Eisenhower’s presidency has risen in the ranks of scholars over the years and I’ve yet to read up on it, so this one seems to be a great book to start with. I’m also looking forward to reading up on his military career. This was my first bio on Eisenhower so I knew what to expect from Smith stylistically-speaking but didn’t know much about Ike. As I mentioned in another comment, although I liked JES’s bios of Grant and FDR a little more than this one, I wouldn’t hesitate to recommend. I don’t yet know, of course, how this will stack up to other Eisenhower biographies I’ll be tackling over the next several weeks but if history is a guide this will be among the best. I pretty much agree with your review. I think this book spends far too little time on the eight years of Eisenhower’s presidency, especially the second term. A good antidote is Jim Newton’s book, which is exclusively about Ike’s presidency (and which I read first). I now have Jim Newton’s book in my queue and should get to it in a few weeks! I have this on my shelf and will probably read it soon. I finished JES’s FDR bio and have Grant on the shelf as well. I thought his FDR work was great, and look forward to the other two! I’ve really enjoyed everything by JES that I’ve read (loved FDR and Grant, really liked Eisenhower). Not sure how I’m going to feel about his bio of Bush 43 which has been the subject of some controversy (and may have benefited from a bit more distance from his presidency). But I can’t wait to see what I think! Excellent book. Smith must have honed his chops as a military historian with the Grant book, because he does a great job describing the military strategy of WW2. I also enjoyed the parts that covered Ike’s relationship with Nixon, which seemed like a mixture of admiration and distrust. Para. 7 needs a grammar check to restore you to excellence in reviewing. Steve, thanks for your review and attention to detail!